Switch off that video game and come to our totally unscripted, spontaneously live and awesomely improvised show about… VIDEO GAMES. From Pac-Man to Pokémon, from crushing the candy to saving the princess, our players will put you in the game! The latest release of Improvilicious features everything you want from a video game, but live on stage! Expect to see a few audience members sucked into the game Jumanji-style. No tricky consoles (just shout out commands), and graphics so good you’ll think it’s the REAL THING. And because it’s improvised, every show is a new and unique awesome ADVENTURE! 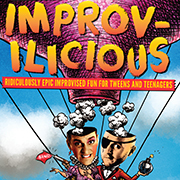 With more atmosphere than your lounge room, and less technology than an Atari 2600, Improvilicious is impro-larious school holiday fun. Our top-scoring players are Brianna Williams (The Big Hoo-Haa), Cassie Daly (Shania Choir, and every Improvised Guide since 2015), Jimmy James Eaton (Arcade Arcade, The Big Hoo-Haa and TV’s Slideshow), and Louisa Fitzhardinge (Spontaneous Broadway, Lost The Plot). 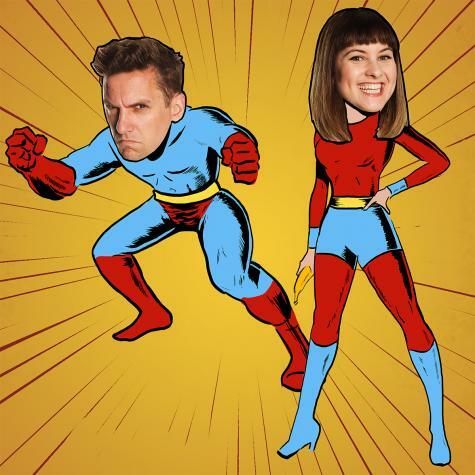 Improvilicious has been delivering the laughs since 2014, with 50-minute improvised guides to Superheroes, BFFs, The Internet, High School and The History of Theatre. "the chemistry between the performers makes this show suitable for the whole family"
Comedian, writer and definitely not three kids in a trench coat. A senior member of The Big Hoo-Haa! Melbourne, Williams has performed all over the world, from Edinburgh, to New York City, to Rottnest Island. 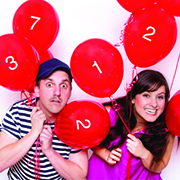 Her unique blend of solo sketch comedy has earned critical acclaim in Melbourne Fringe, Perth Fringeworld and Melbourne International Comedy Festival. On Channel 10 she co-hosts The Bachelor/Bachelorette Unpacked. began performing at the age of 12, when her teacher taught her Space Jump and she learnt she could make people laugh without saying “poo” or “fart”. A constant performer, Cassie has played Juliet in Romeo and Juliet, Olivia in Twelfth Night and Portia in The Merchant of Venice - and has toured schools all over WA and Victoria with countless theatre in education productions. is an award-nominated actor, comedian, and grammar nerd. She recently hosted Lost the Plot, a literature game show, at the Melbourne Emerging Writers' Festival. She has won Sci Fight (a monthly science comedy debate) and appears regularly with much-loved improvised comedy troupes The Big Hoo-Haa!, Impromptunes, Spontaneous Broadway and Soothplayers: Completely Improvised Shakespeare. is the company of director Jeremy Rice and writer Kate Rice. Recent productions include Shoot From The Hip by Justin Cheek for the 2015 Melbourne Fringe Festival, 3 Seeds: short plays by Afeif Ismail at the Blue Room Theatre Perth, Royals by Kate Rice for 2014 Melbourne Fringe Festival, and Monologue for a Murderer by Kate Rice at La Mama Courthouse Theatre. Improvilicious! is perfect for schools: 50 minutes plus Q&A, completely self-contained, teacher’s pack with classroom activity plans and curriculum links, student participation and ENTERTAINING! 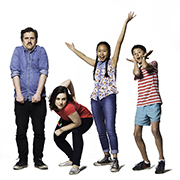 You class will think you’re the COOLEST EVER teacher if you book one or more of our Improvilicious shows to come to your school.